Today’s wedding is right up my alley. 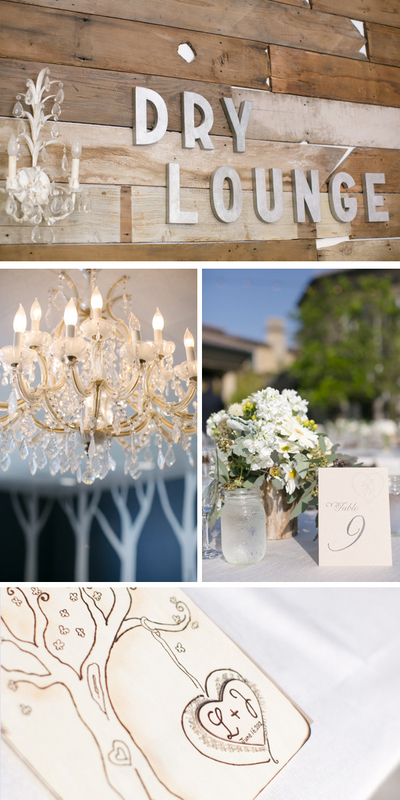 It’s a little bit vintage, a little bit country, and a whole lotta pretty! Not to mention this bride is wearing the Kate Spade shoes I have been coveting for ages. 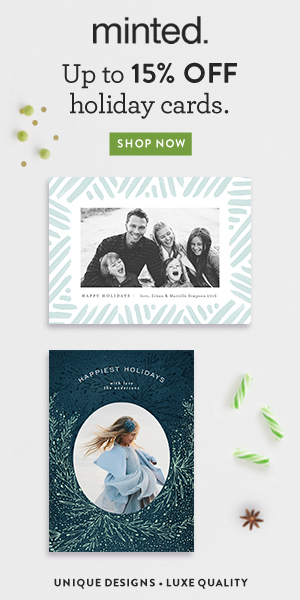 So much drool-worthy inspiration here, so get your cup of coffee, get comfortable, and get your pinning finger ready! I saw a picture of Kevin Costner at his wedding with his bride and they had taken pictures in front of an old fashioned truck. 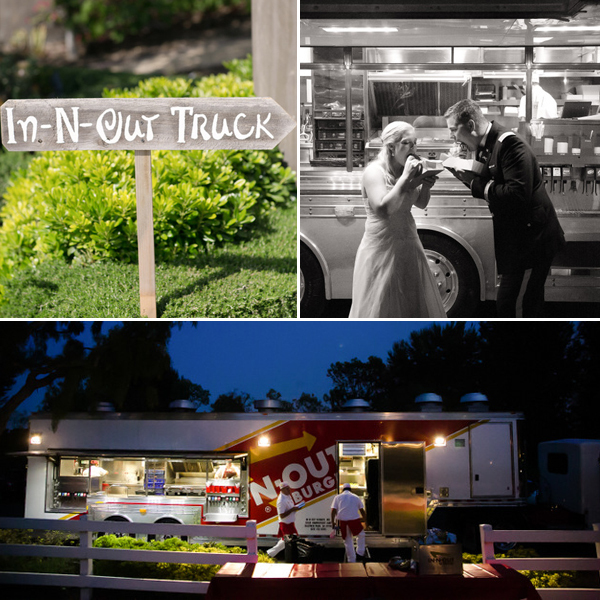 I knew immediately I wanted to intertwine this truck idea into our wedding. 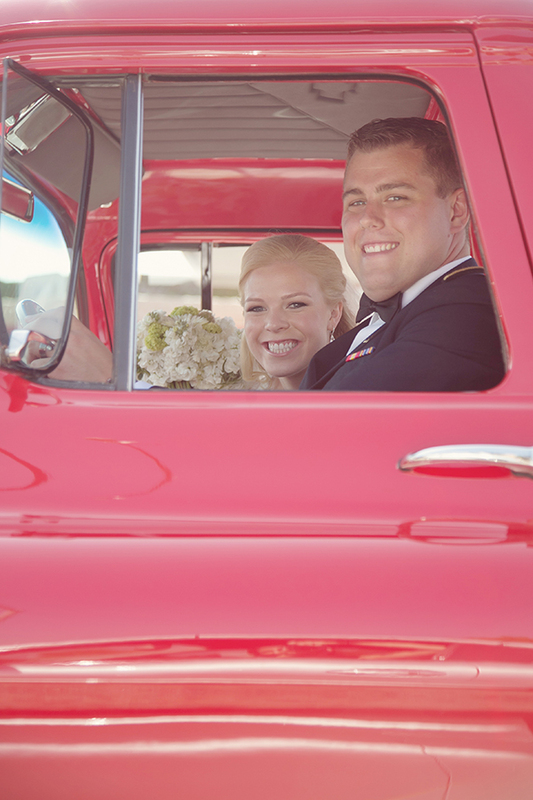 At first, our save-the-dates had postage of a red old-fashioned truck that read “Getting’ Hitched!” And my uncle owns a car dealership and he just happened to have a 1950’s red truck! We drove this truck from the ceremony to the reception. I found a picture of a backyard wedding that had old fashioned lights strung across the yard and really wanted them for our wedding, but found they were very expensive to rent. My dad promised me that we would have the lights because they were very important to me. The week of the wedding my dad, fiancé, and uncle spent a day putting the poles in the ground and hanging the lights from the roof. They made a huge difference in the wedding because the lights brought a sense of romance once the sun went down! 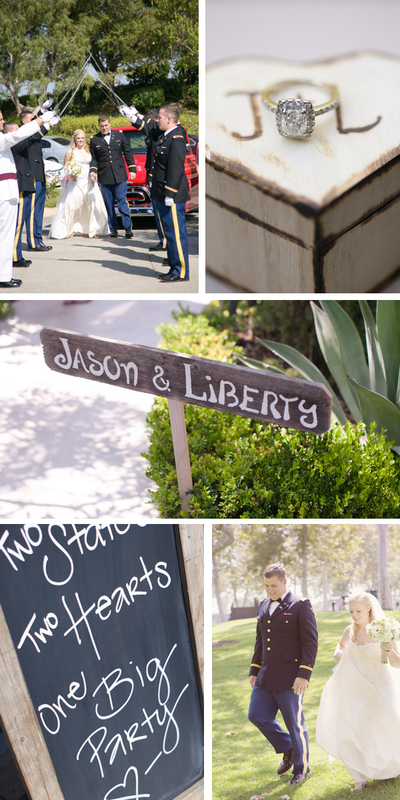 Jason and Liberty wanted to incorporate their love for vintage Americana (Jason is in the Army) and the outdoors. Using birchwood, moss, mazanita branches, daisies, rocks and other natural elements, Jason and Liberty created a wedding that was the perfect combination of their two favorite things. 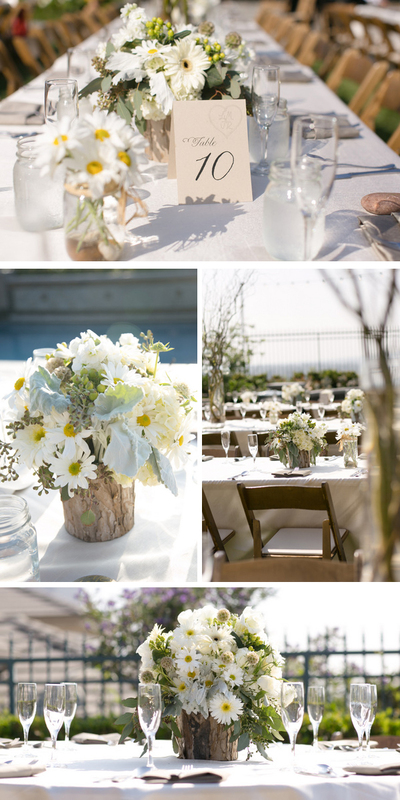 My vision for our wedding was a rustic, country theme. My main goal for the wedding was for guests to really feel like the wedding came from the heart. I wanted guests to see décor and special parts of the wedding and think, “oh my gosh, that’s the cutest thing I have ever seen!” I didn’t have a specific color scheme, but the wedding was made up of champagnes, ivory’s, laces, and a lot of wood! More than anything I wanted everyone to feel the love that Jason and I share, and I tried to bring that out through the details of our wedding! 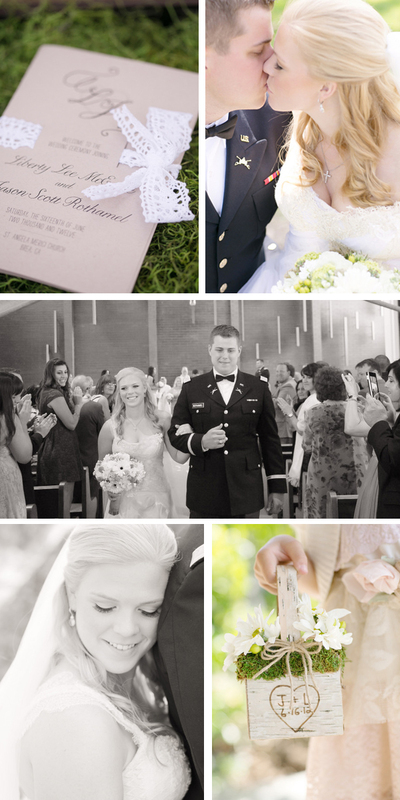 Everything in our wedding was made possible by our amazing wedding planner, Katie Webb, from Intertwined. Did I tell you? The pretty florals, the fab bridesmaids’ style, the sweet DIY and personal touches, and THOSE SHOES. I love every single thing. It was, as the bride hoped, the cutest thing! Plus I feel like I got a feel of who this couple is through their wedding, which I always think is the ultimate goal – it means you made your wedding YOU. And such a job well done to all of the vendors involved. 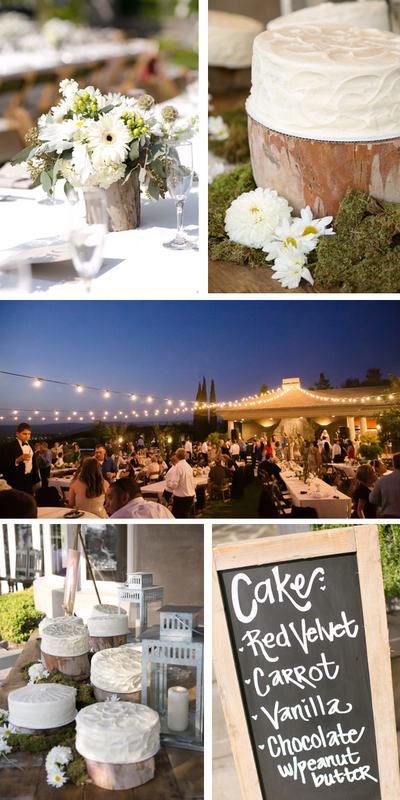 So tell me, what’s your favorite part of this lovely country-chic wedding? 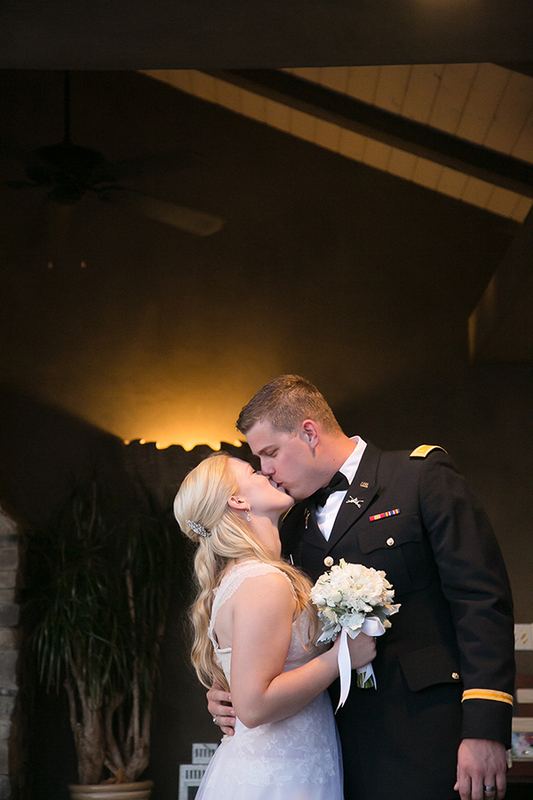 This wedding was perfect down to every last detail. Amazingly beautiful! Kudos to the bride and groom for making such a great beautiful wedding. My wish is that they will be happy forever. Loving those bridesmaid dresses! Beautiful color palette. Gorgeous wedding. So much attention to detail. 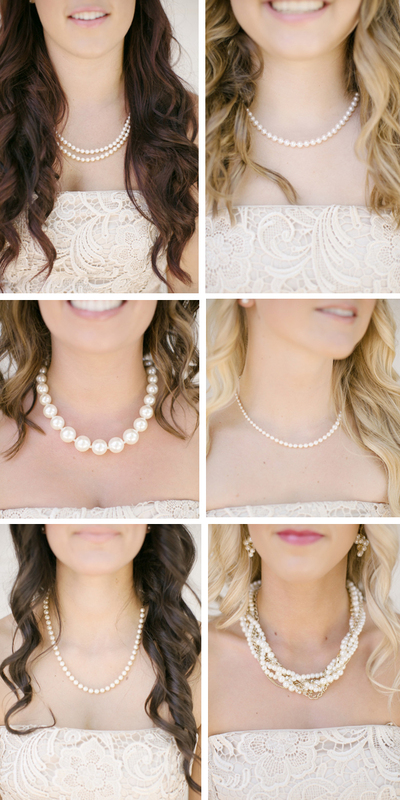 Love the fact that the bridesmaids all had a variation of pearls. Congratulations on a fantastic day! Lovely! I love the bridesmaids and flower girl dresses! Do you know where she got them or what designer they are? Beautiful wedding! 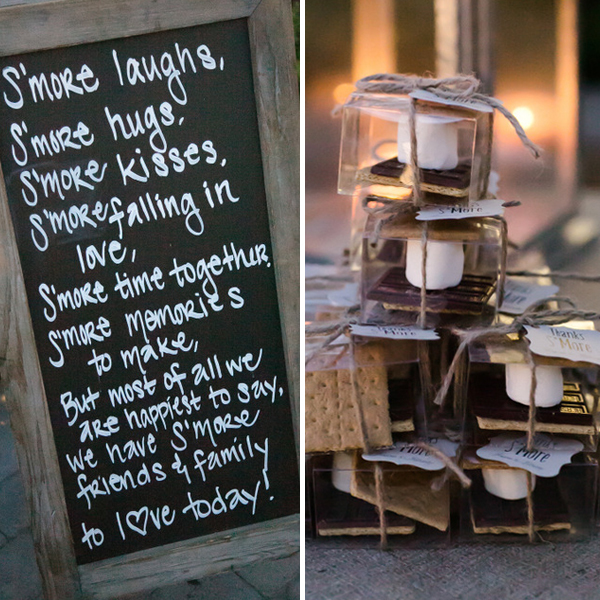 I am thinking about making the s’mores as my wedding favor. Do you recall where you purchased the boxes and what size they were? Is there a website you purchased those necklaces?? 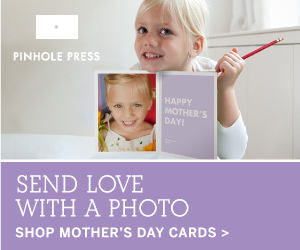 They would be perfect for my girls too! Where did you get the bridesmaid necklaces??? Hi. Love the little boxes for the Smores!! Do you remember where you found them?? Thank you!! I would love to know where you got the boxes for the S’mores too!!! Please share.